For space economy, in small buildings the staircase is constructed with winder steps; practically it does not have levels but crooked flights. These flights, for a less strenuous reinforcement implementation, are considered to be level and are reinforced by following rules similar to those regarding straight staircases. Every flight is reinforced separately from the other however, constructionally they intersect. The two primary flights which are sited upon two opposite beams (sections 1-1 and 2-2) are firstly reinforced then follows the reinforcement of the secondary vertical flights. In space-economical winder staircases, the supports’ distances between the columns are rela-tively short therefore; there is no need to construct beams as well. This happens because, apart from the technical difficulties that it involves, it leads to the formation of extremely strong short columns which are particularly dangerous during an earthquake. An efficient simulation of the static behavior can be achieved by using reinforced zones between the supports from column to column or from beam to column and then to reinforcing the primary and secondary staircase flights, as shown at the following example. 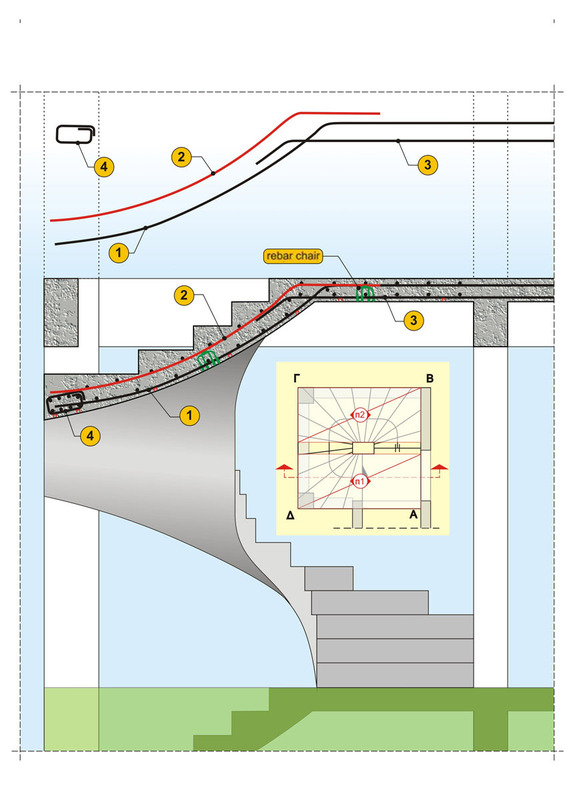 (a) Simultaneous reinforcement implementation and concrete casting of both the staircase and the shear wall. Theoretically, this is the most effective solution however, it involves large con-structional difficulties and therefore it is not usually chosen. 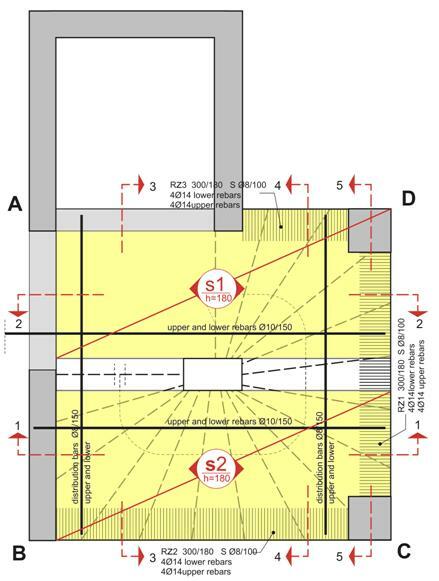 (b) Positioning of starter bars (3) and (4) during the shear wall’s construction. This practice is being followed in the above example. It is recommended to place the starter bars by the way explained in §3.2.7, in short height though. (c) Positioning of starter bars (3) and (4) during the shear wall’s construction, without the forma-tion of a ‘nest’. 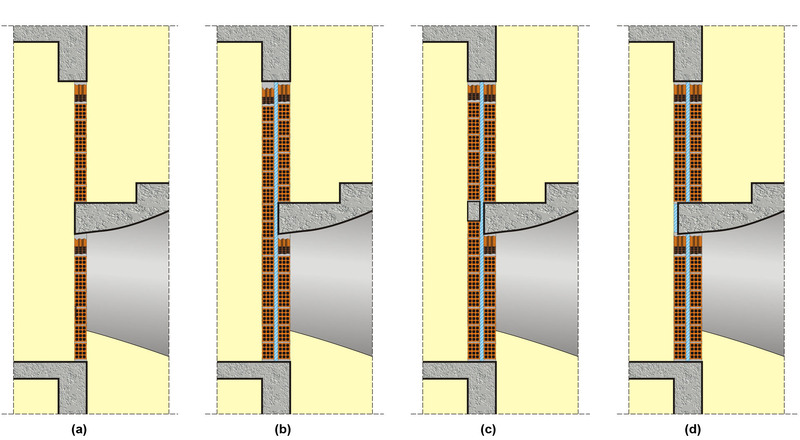 (d) Positioning of starter bars (3) and (4) after the shear wall’s construction, by drilling holes and resins usage. (e) Fitting of special supports upon the shear wall, for the formation of specific support condi-tions e.g. pin support. (f) Avoidance of anchorage into the shear wall by forming a reinforced zone parallel to it (this zone is, either way formed by the distribution reinforcement). Of course, in any case, the longi-tudinal reinforced zone RΖ2 must be properly anchored upon the shear wall. The reinforcement zone along the secondary direction of the staircase’s support, could be ne-glected, however- as a slab’s free edge- it would require hairpin reinforcement (see § 2.6.1). The difference in labor cost and used materials between those two options is not significant. 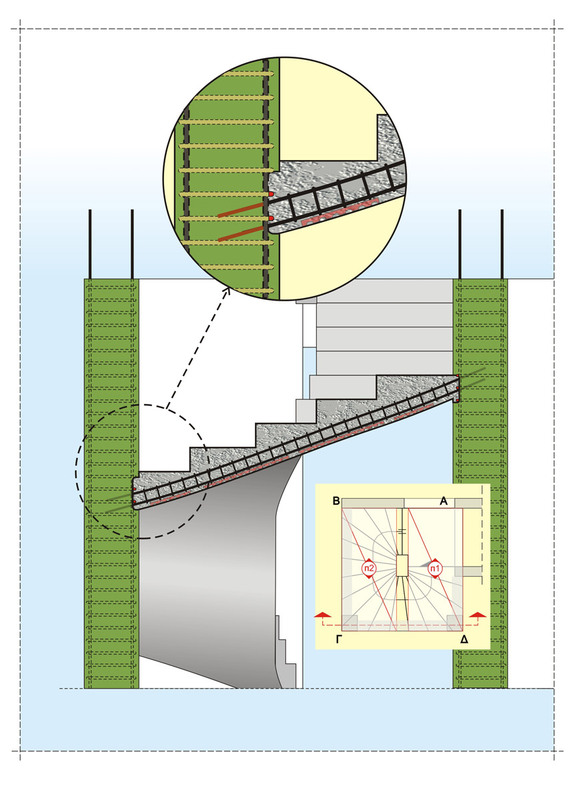 The use a reinforced zone with the upper and lower reinforcement enhances the ductile behav-ior of the staircase. Due to the large section width of the staircase, the shear strength is usually high enough; there-fore, the usage of open-form stirrups-rebar chairs is acceptable. Of course, it is more effective for the stirrups to be properly closed with hooks bent at 135°. 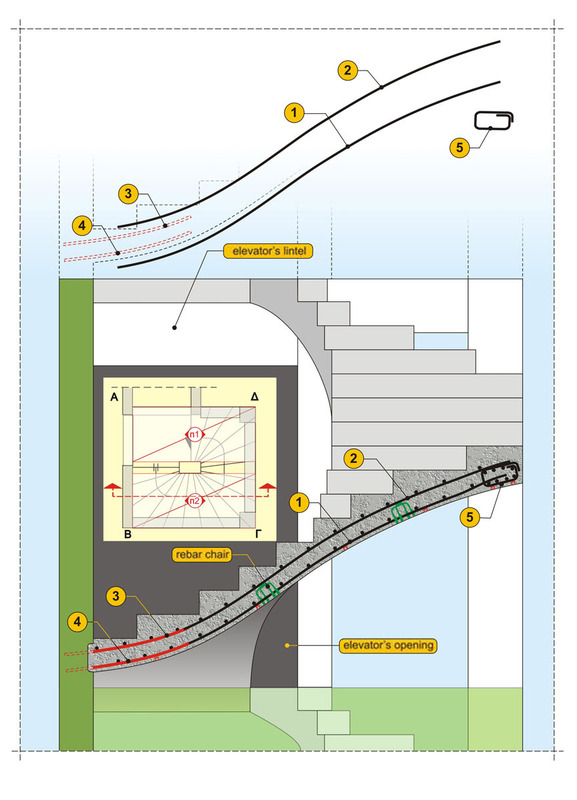 In winder staircases, extra attention must be paid to the horizontal area between the flights both during the design and the planking of the staircase so as to ensure that the staircase’s thick-ness (vertical to the planking) is equal to the thickness of its outer flight. Then it will be feasible to secure the proper positioning of the upper reinforcement grate with rebar chairs of equal height. These rebar chairs can be four-legged industrial produced, wiggly impromptu created or handmade hairpin bars placed at the distribution rebars ends. When the staircase is supported upon a column, the applied rules are the same with those men-tioned above regarding the staircase’s support upon a shear wall. Either there are starter bars or they are fitted afterwards with resins, the bars of the reinforced zone are placed as unified pieces. Since, as a rule, the outer flight is smooth, it can be rein-forced with bars of a larger diameter compared to those used in the staircase. Generally, the smaller the diameter of the staircase rebars is, the less strenuous is the shaping of the bars’ various parts. 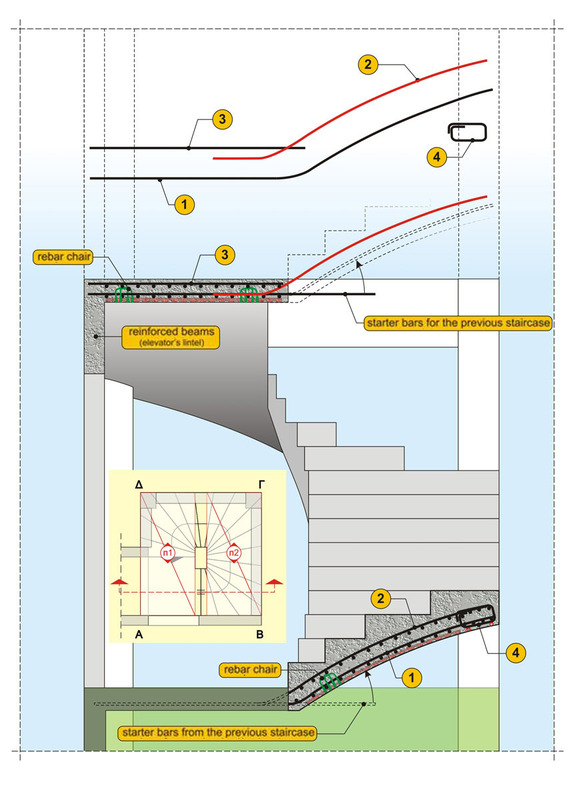 1) If the masonry filling at the area surrounding the staircase is considered to be rigid, the con-struction of reinforced zones, in the secondary flights of the staircase, enhances the ductility of the surrounding area. 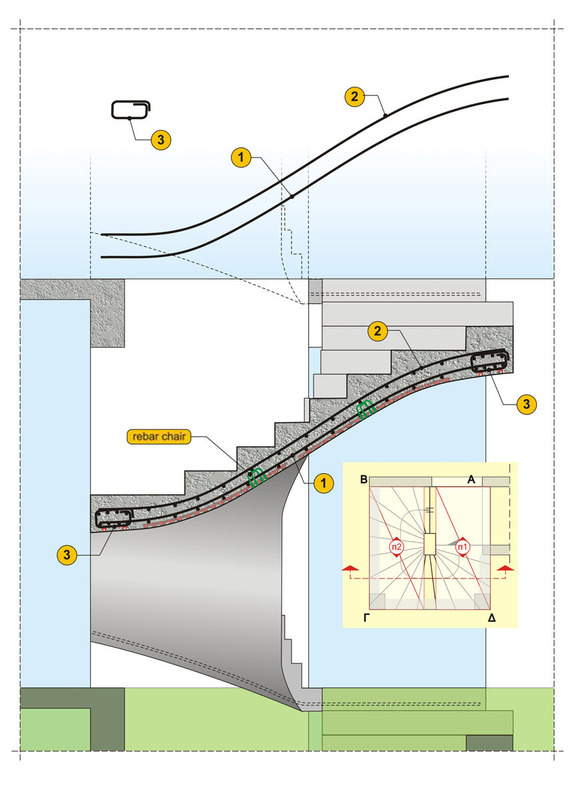 This, in the case of an earthquake, helps to the cracking avoidance in both the staircase and the filling walls (behavior analogous to a bonding beam).